Granola was developed in the United States during the 1890s. Although extremely similar is appearance, granola and Muesli, which was developed in the1900s, are two completely different mixtures. Typically, a granola mixture includes oats, nuts, seeds and dry fruit. There is no one specific grain that is used in a granola mixture. A notable difference between granola and Muesli is that granola is cooked while Muesli is soaked in milk and eaten raw. Once the granola ingredients have been assembled, oil or butter and honey or maple syrup are added and everything is tossed together. The mixture is then baked until the ingredients are transformed into crunchy clusters. Granola is eaten as a breakfast food and as a snack food. It is often paired with yogurt or milk. Granola trail mix is a portable snack. It is sometimes baked into bars to make it a convenient grab-and-go snack. Granola is frequently used as a topping sprinkled over desserts. With the variety of ingredient options available, healthy granola can be personalized to include your favorite type of nuts, seeds and dried fruit. Granola mixes can be selected to meet specific dietary needs and can therefore easily be included in a health-conscious lifestyle. When you include healthy granola with nuts and dried fruits into your snack routine or meal plans, you can more easily meet your daily nutritional needs. Dried fruit such as mangoes, pineapple, bananas and raisins are a good source of vitamins, minerals, antioxidants and enzymes that can help you stay healthy and energized. Cashews, peanuts, almonds, brazil nuts and all other varieties of nuts are a powerhouse of vitamins and minerals. 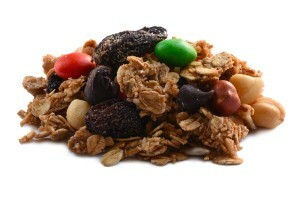 A granola trail mix that includes nuts and dried fruit is a winning combination of goodness. When eaten for breakfast or for an evening meal, a mix of grains, dried fruit and nuts has a high fiber content that contributes to a feeling of satiety . When you buy granola in bulk, you will always have it available to reach for when a snack urge hits. It’s far better than indulging in a snack that offers little or no nutritional benefits. 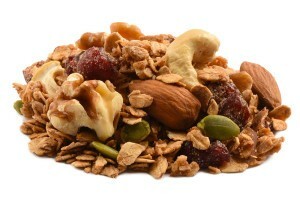 There’s a considerable amount of diversity of flavor and texture in granola blends that contain nuts and dried fruit. A combination that includes mangoes and pineapples have a tropical flair. Granola with raisins and almonds is more of a traditional mix. Granola that includes dried berries is festive in appearance and has the tartness to wake up your taste buds. Once you discover the many health benefits of granola, you’ll likely want to buy granola wholesale as a budget-friendly way to keep plenty available to eat as a snack, include in a variety of recipes, bake into portable granola bars and to enjoy as a quick, healthy meal. The individual ingredients in granola have specific benefits. When you combine those benefits you acquire a considerable portion of the vitamins and minerals you need each day. Oats, seeds, nuts and dried fruit are excellent sources of fiber. Their high fiber content helps support digestive health. The soluble fiber they provide helps alleviate constipation and help reduce colorectal cancer. Getting the proper amount of fiber in your diet is beneficial to your heart. Granola can help lower your blood pressure and reduce your LDL cholesterol. The ingredients in granola are a good source of manganese. Manganese is credited with helping prevent cancer and heart disease. Manganese is a mineral that is vital to the proper functioning of the liver and kidneys. It helps keep your body working efficiently. Manganese helps promote proper metabolic function and boosts energy. Granola is also a good source of iron. An iron deficiency can affect you in many ways. It will make you feel tired, can cause headaches, depression and prevent you from thinking clearly. While it is essential that you check the calorie content of various granola mixes, when you make appropriate selections, granola can be a beneficial part of a weight loss plan. When you eat granola you feel full faster and longer. That reduces the desire to snack inappropriately while dieting. Making bulk granola purchases so that you can include granola as a regular part of your diet is a great way to support brain health. Granola has a high level of potassium which stimulates brain activity. A brain boosting food is the ideal way to get your day started off right. It’s also a good snack option when you need something to combat mental sluggishness. Granola was invented in Dansville, New York in 1863. Granola experienced a renewal or revival of interest in the 1960s when nuts and fruit were added to it. Due to the timing of this revived interest, granola is sometimes referred to as “hippie” food. It was a popular food among those who were focused on healthy eating habits in the mid-1900s. Granola began being enjoyed in bar form in the 1980s. January 21is considered to be the “unofficial” National Granola Bar day. Granola is popular with the outdoor enthusiast who needs a portable, energizing snack while hiking, biking or pursuing other outdoor adventures.